For the forth edition of Ciao Philadelphia a big mandolin orchestra played a concert dedicated to the music of classic Italian films. 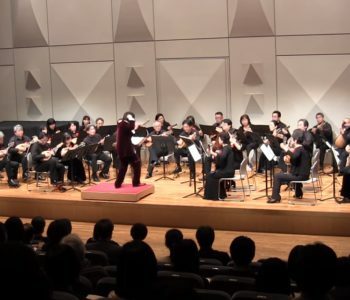 Videos form this concert are now available at youtube. 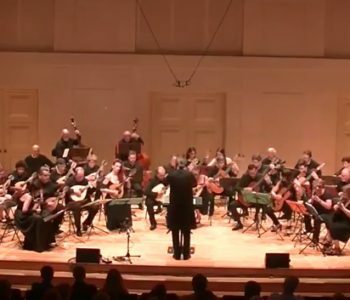 Members from 10 mandolin and guitar orchestras from across Pennsylvania, New York, Maryland, and Washington DC gathered to form the 60-piece Ciao Philadelphia Mandolin Orchestra. The ensemble prepared and performed a program of music from classic Italian films. On Nov. 5, 2017, the orchestra, under the direction of Mark Linkins, performed to a packed house at the Rotwitt Theater on the campus of Rosemont College in Rosemont, PA. 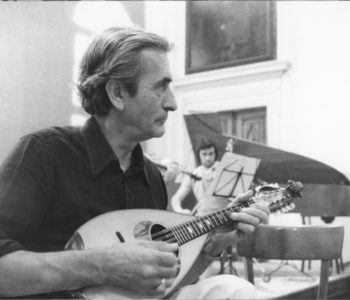 The orchestra shared the program with renown Italian mandolinist Carlo Aonzo and his trio (including Lorenzo Piccone, guitar, and Luciano Puppo, bass). They performed works from their CD “A Mandolin Journey.” Photo credits: Chris Swisher. Greater Philadelphia boasts one of the largest, and most accomplished, Italian-American communities in the United States. The birthplace of the United States of America, Philadelphia is a city deeply connected to Italian values and the Italian way of life, exemplified by the rich universities, museums, art centers, and neighborhoods and contributions of Italian Heritage. I am proud to announce that the Consulate General of Italy – in partnership with area civic, academic, cultural and business leaders – is launching the fourth edition of Ciao Philadelphia in October 2017 after the success of its previous editions in 2016, 2015, and 2014.